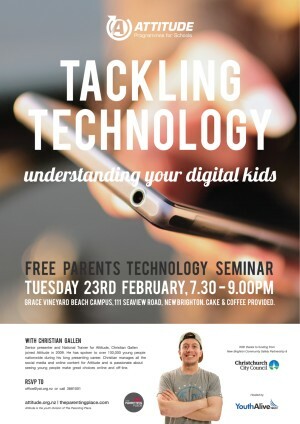 Eastside parents, caregivers, grandparents, teachers, or anyone working with young people are invited to a seminar to update you on how technology is affecting young people, and some tips and techniques to protect them and your family. Led by the hilarious Christian Gallen, an experienced Attitude presenter, part of The Parenting Place, who has done inspirational talks to over 100,000 New Zealand young people!! Cake & Coffee also provided with thanks to funding from the Burwood Pegasus Board of the Christchurch City Council, through the New Brighton Community Safety Partnership. RSVP to: office@yat.org.nz although walk-in’s on the night are very probably. Max 280 seats.